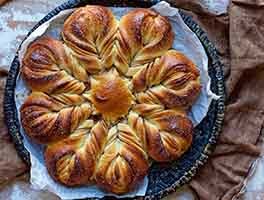 These cinnamon buns are irresistibly flaky and tender; a layer of cream cheese adds richness to their filling. 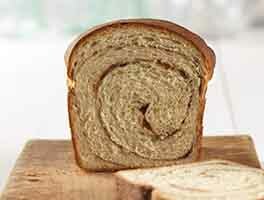 Thanks to Red Star Yeast, one of our valued partners, for this recipe. 5 hrs 10 mins. to 5 hrs 30 mins. *See substitute in tips, below. To make the dough: Mix and knead together all of the dough ingredients to make a smooth, soft dough. Place the dough in a lightly greased bowl or in an 8-cup measure; the measure helps you judge how much it's risen. Let it rise until it's almost double in size, about 2 hours. To make the filling: Combine the nuts in one bowl, and the Baker's Cinnamon Filling and water (or substitute ingredients) in another. Roll the dough into a 14" x 12" rectangle. Spread the softened cream cheese evenly over the surface. Fold one short end into the center. Fold the other short end over the first, like you were folding a letter. Roll the dough into a 14" x 12" rectangle again, and fold it like a letter again. Roll the dough into a 12" x 18" rectangle. Spread the cinnamon filling evenly over the dough, followed by the nuts. Beginning with one long edge, roll the dough into a log. Cut the log into 9 equal slices. Place the slices in a greased 9" square or 10" square baking pan, cover with plastic wrap, and let rise for 2 hours. Towards the end of the rising time, preheat the oven to 375°F. Bake the rolls for 30 to 35 minutes, until they're golden brown. Remove the rolls from the oven. To ice, whisk together the sugar and milk, drizzle icing over the buns, and serve warm. No Baker's Cinnamon Filling on hand? Substitute the following: 1/3 cup (2 5/8 ounces) unsalted butter, softened; 1 cup (7 1/4 ounces) brown sugar, packed; and 3 tablespoons (3/4 ounce) ground cinnamon. OMIT the ¼ cup water. 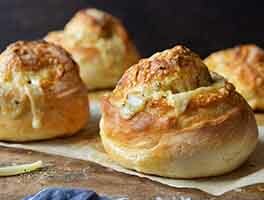 Want fresh-baked, oven-warm buns in the morning? Prepare the buns through their rise in the pan (step 8). Cover and refrigerator overnight. Next day, allow the buns to rest at room temperature for 15 minutes before baking; you may need to increase the baking time by a few minutes. If you ice the buns while they're warm, the icing will soak in and disappear. If you want the icing to stay on top, remove the buns from the oven, and turn them out of the pan onto a rack to cool. When completely cool, drizzle with icing. Hello! I make this recipe every Christmas and it is a huge hit. The dough is absolute heaven. I'd like to make it for a brunch event coming up but I'd like to offer mini buns. 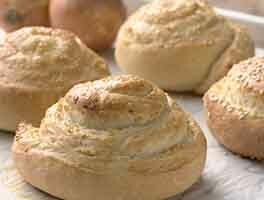 How would you recommend adjusting the recipe to make 18 mini buns (or is that a horrible idea?!) I imagine you'd make a longer rectangle before rolling? I appreciate any recommendations! I made these for my husband when he was disappointed with some store bought buns and there is no comparison. These are terrific. The dough came together beautifully and was easy to work with. I used the brown sugar, butter, cinnamon mix for the filling and while I didn't have a problem with the cream cheese layer, it was a little fussy and I might try them without to see if it's missed. I cut the roll into 1-1/2" thick pieces and got 12; they fit a 13x9" pan just right. I used a cream cheese frosting on top. Very nice, soft bun. I will definitely make these again. The cream cheese adds a nice flavor that breaks up the sweetness of the frosting. I have a couple of comments. Notes: Use salted butter or increase the salt to 2tsps, otherwise dough is a bit bland. You can reduce the second prove to one hour with no issues. I added a few extra tablespoons of flour to make the dough come together. You don't need the fancy filling, just use cinnamon and sugar. Make sure you warm up your cream cheese for 30 secs in the microwave. The importance of pan size: I made this recipe last Christmas and made the mistake of not using the correct size pan. The pan I used was slightly bigger than what's recommended and the rolls unravelled ever so slightly creating rolls that were dry and messy. 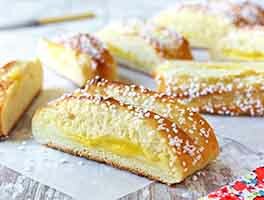 I persisted and made them again this year with the correct size pan and they were ABSOLUTE HEAVEN! The dough is so moist and springy and the filling is absolutely delightful! My family went crazy for these. If you follow the directions precisely you will not be disappointed! These turned out really well, made them for the first time today. I read all the reviews and took many tips from other bakers, but had one slight problem. In some areas the cream cheese did not dissolve into the dough when baked leaving pockets of small curds. These curds were not visually appealing and didn't taste that great. Otherwise this recipe was a winner. I guess next time I won't use the entire package of cream cheese and be sure to get a smooth even layer of it on the dough before laminating. 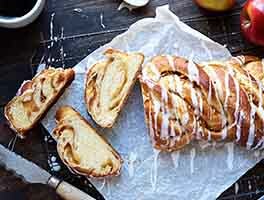 I've made cinnamon rolls many times over but something went off the rails here with this recipe - I hate when that happens and ingredients are wasted. All ingredients were weighed precisely. Some where between Spreading the softened cream cheese (wasn't as simple as when butter is used) and folding and rolling the dough the consistency of the dough changed. The second rise spread more outward than tall and puffy. The finished product came out on the flat side- the taste was okay. And after icing them, the appearance was okay. This was a wonderful treat, though I think a very big part of that is the Baker's Cinnamon Filling which I have used for years and is definitely worth paying shipping for! I am glad that I noticed that other people used a 9x13" pan because it would have overflowed a 9" square one. I also cut it into 12 pieces just because it was easier to divide up among us to have 12 pieces instead of 9, but they were still plenty big enough. I will definitely make these again! Yum! Firstly the buns are delicious, however making of it is very very messy. When trying to roll out the dough after spreading create cheese and folding the dough, the cream cheese squeezes out from everywhere making dough difficult and slimy to handle. Would appreciate some advice as to what I am not doing right to stop this from happening as I love the buns! I have made this recipe two times now, and it's wonderful. On the second time I did a variation: I used Nutella instead of cinnamon filling and sprinked the Nutella with chopped hazelnuts and mini chocolate chips. I made the icing the same except that I added a little cocoa powder. They were amazing both ways.